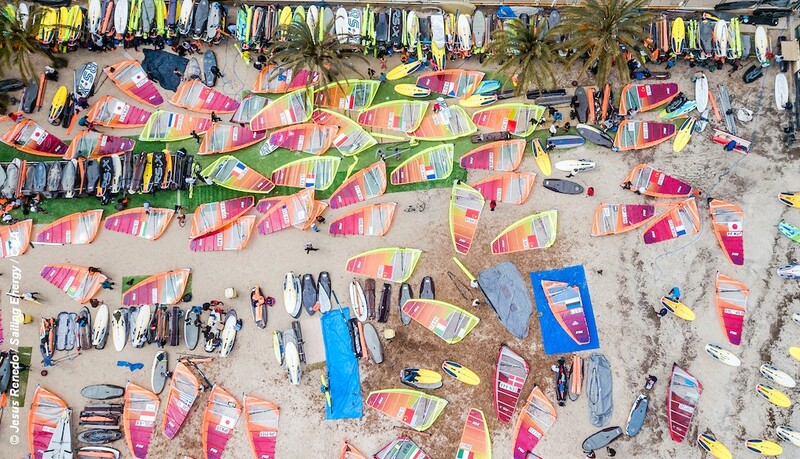 Day 1 of the RS:X European Championships taking place at the Club Nautic Arenal, Mallorca, with three qualification flight races completed. Early leaders in the men are the Italians Daniele Benedetti (1,1,4) and Luca di Tomassi (2,3,5) with Clement Bourgeois of France (5,2,5) in third place. In the women’s event Yunxiu Lu (2,3,1) of China has a one point lead ahead of Charline Picon (1,2,4) of France, with third Poland’s Maja Dziarnowska (3,1,6). Best placed British competitors are Emma Wilson 7th, Bryony Shaw 13th and Saskia Sills 19th in the women, and in the men Tom Squires 21st and Andy Brown 28th. In the Youth events, Vardimon Tomer (1,1,1) of Israel leads the men and Naama Gazitof (1,8,3) also of Israel, the women. Best placed British youth competitors are, Finn Hawkins in 9th in the men and Mollie Densley-Robins 19th in the women. Racing on Tuesday and Wednesday is qualifying races for all fleets except the youth women who will be racing together all week. As racing moves to Thursday and Friday the remaining fleets will be split into Gold and Silver fleets where the top ten of the Gold fleet will move to Saturday’s Medal Races.